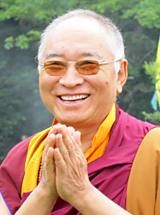 Khenpo Tsewang Dongyal was born in Tibet in 1950, and was recognized as a tulku of Khenpo Sherab Khyentse, the head abbot lama of Gochen Monastery in Kham, who was a renowned scholar and practitioner who lived much of his life in retreat. In 1960 Khenpo Tsewang Dongyal and his brother Khenpo Palden Sherab together with their family escaped from Tibet. In India, he studied at the Central Institute of Higher Tibetan Studies, and received his Bachelor’s Degree from Sanskrit University in 1970. In 1978, H. H. Dudjom Rinpoche appointed him as the khenpo of the Wish-fulfilling Nyingmapa Institute in Boudhanath, Nepal. During the 1980’s Khenpo studied and worked closely with Dudjom Rinpoche in France and at the Yeshe Nyingpo centre in New York. During the 1980's he began orally translating the teachings of his brother, Khenpo Palden Sherab, at various centres in the U.S. In 1988, the brother khenpos founded the Padmasambhava Buddhist Centres, which now have branches in the U.S., India, and Russia. This page was last edited on 24 August 2017, at 12:22.